There are thousands of things to see along any of our trips. Waterfalls, quiet forests, mountains, and gurgling streams. These are but a few of the beautiful views that you can experience on our tours. An area rich in history and geologic marvels, America's mid-Atlantic has a variety of sites you will definitely want to visit. If you would like to see more images of our trips, visit our GoPhoto Gallery. If you are interested in seeing a detailed route for one of our tours, you may want to use Google Earth and download the GAP detailed track with maps Google Earth file, or the GAP-C&O GPS Track, that can be used with Google Earth or other GPS programs/receivers. To use the Google Earth file, you will need to install Google Earth. Once you have installed the program, simply import one of the files. 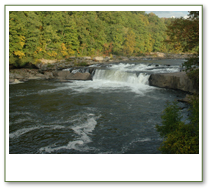 A crown jewel of the Pennsylvania park system, Ohiopyle is situated where the slopes of Laurel Ridge clash with the Youghiogheny River. This clash has resulted in waterfalls, whitewater rapids, scenic overlooks, rock outcroppings, and a steep mountainous landscape. Combine that with a maturing forest and wildlife, and you've got a paradise for outdoor enthusiasts of all kinds, for all seasons. Youghiogheny River's twenty-foot fall marks the focal point for most visitors to the park, with the visitor center located nearby. Rivaling the mighty cataract for popularity is the 30-foot bridal veil Cucumber Run waterfall, arguably the park's most beautiful. The other permanent waterfalls include the Jonathan Run Falls and Meadow Run's Cascades - they require a mile or more of hiking, but are well worth it. The word "otter" derives from the Old English word otr, otor or oter. This and cognate words in other Indo-European languages ultimately stem from a root which also gave rise to the English words "water", "wet" and "winter". Otters have long, slim bodies and relatively short limbs, with webbed paws. Most have sharp claws on their feet, and almost all have long muscular tails. They have a very soft underfur which is protected by their outer layer of long guard hair. This traps a layer of air, and keeps them dry and warm under water. Most otters have fish as the primary item in their diet, supplemented by frogs, crayfish and crabs. Some are expert at opening shellfish, and others will take any available small mammals or birds. This prey-dependence leaves otters very vulnerable to prey depletion. 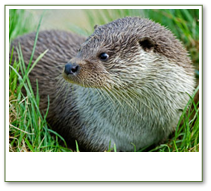 Otters are very active, chasing prey in the water or searching the beds of rivers and, lakes. We see them most frequently in the watery western section of the C&O Canal. Most otter species live beside water, entering it mainly to hunt or travel, otherwise spending much of their time on land to avoid their fur becoming waterlogged. Otters are playful animals, for example sliding repeatedly down snowy slopes, apparently from sheer enjoyment. Different species vary in their social structure, with some being largely solitary, while others live in groups  in a few species these groups may be fairly large. 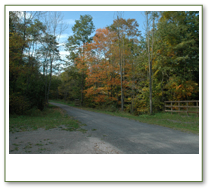 The recreational use of State Forest land is quite varied. Some of the most common activities include scenic driving, camping, hiking, mountain biking, and nature watching. Some of the less common uses include dogsledding, and kayaking. Forests have always been important to the inhabitants of the area we now call "Pennsylvania" (Latin for "Penn's Woods"). Pennsylvania's location spanning 40 degrees - 42 degrees north latitude and its varied terrain support 108 species of native trees and many other introduced from Europe and Asia. Trees provide a renewable source of lumber, paper, nuts and chemicals. But they are also essential as living filters, removing pollution from the air we breath and the water we drink. Trees provide homes and food for wildlife, and beautify our homes with comforting shade in summer and shelter from winter winds. With wise management, forests can produce these benefits for future generations as they have in the past. Many different rivers follow or cross the C&O Canal and Great Allegheny Passage trails. 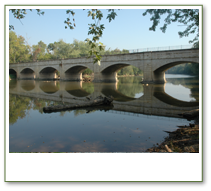 You will see lazy rivers and creeks that pass under the trail, as you cross on Aqueducts, such as the Monocacy aqueduct, a magnificent seven span wonder, that was restored in 2006, and tumbling rivers that squeeze through the mountains along the GAP. Some of the most interesting waterways are the creeks that pass under the C&O Canal through large culverts. Each of the rivers and streams contribute to the region's natural beauty and provide you with a peaceful feeling while you get some sun, fresh air and exercise. The Shenandoah River is a tributary of the Potomac River, approximately 150 mi (241 km) long, in the U.S. states of Virginia and West Virginia. The principal tributary of the Potomac, the river and its tributaries drain several lateral valleys in the Appalachians on the west side of the Blue Ridge Mountains, mostly in northwestern Virginia. The Shenandoah is one of the rare North American rivers that flows to the north. 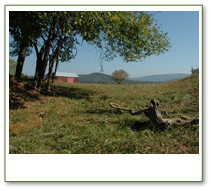 It is formed north of Front Royal at Riverton, Virginia, by the confluence of the South Fork (the longer branch) and the North Fork. It flows northeast across Warren and Clarke counties, then into West Virginia, crossing the extreme eastern tip of the state. It joins the Potomac from the south near Harpers Ferry, West Virginia. In Western Maryland is a stream called Antietam Creek. Nearby is the quiet town of Sharpsburg. The scene is pastoral, with rolling hills and farmlands and patches of woods. Stone monuments and bronze tablets dot the landscape. They seem strangely out of place. Only some extraordinary event can explain their presence. Almost by chance, two great armies collided here. Gen. Robert E. Lee's Confederate Army of Northern Virginia was invading the North. Maj. Gen. George R. McClellan's Union Army of the Potomac was out to stop him. On September 17, 1862the bloodiest day of the Civil Warthe two armies fought the Battle of Antietam to decide the issue. 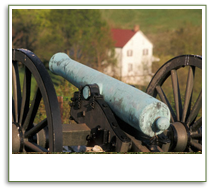 During your tour of the C&O Canal, you can take an optional side trip to the battlefield and cycle through a significant part of the park or view the movie about the battle, before returning back to the trail. The idea of buying fresh, local food gets a lot of attention these days...but it’s nothing new to the farmers and folks of the areas we pass through. Although the total number of farms and farm acreage has declined over the years, many of agricultural producers surrounding the trail sell directly to the consuming public. As you ride along the C&O Canal, watch for the towpath to leave the Potomac Riverbed, and traverse long sections of flat farmland. One stretch east of Hancock leaves the river for a four-mile traverse across farmland. All around the Casselman and Youghiogheny river valleys, farms dot the landscape. They are usually just one ridge from where you are riding. If you opt to shuttle around any segment of the tour, with the exception of the two endpoints, you are likely to travel through picturesque farmland, and oftentimes, your support personnel can take you to some interesting sights just off the trail, or on the support route between Rest Go's, such as the Humboldt Covered Bridge. Get Out & Go Tours LLC, © 2013. All Rights Reserved.